NOMINATIONS for FA of Malaysia’s (FAM) top posts are a hatful despite Malaysia’s Fifa ranking of 161. There is much keenness for posts in an association often criticised by the media for embarrassingly inadequate management. It will be interesting to see whether the nominees have come forward with noble motives to revive Malaysian football’s slumping standards. Or are the teeming nominations owed to a desire for the glamour and perks that go with being involved with the world’s most popular sport? Inevitably, attenion revolves around the contest for the president’s post featurning four contestants: Johor Crown Prince Tunku Ismail Ibrahim, Sports Minister Khairy Jamaluddin, FAM Integrity Committee chairman Tan Sri Aseh Che Mat, and former FA of Kelantan president Tan Sri Annuar Musa. There are 10 nominations for the two deputy president’s posts and 14 for the four vice-presidential slots. The nominees have until Feb 13 to confirm acceptance of nominations. There will be a final executive council meeting of the current term on that day, after which the confirmed candidates will be formally announced. With the exception of Tunku Ismail who is a popular choice among the affiliates, despite him having stated he is not interested and throwing his support beind Aseh, the rest must surely have indicated their keenness to be nominated by the 20 affiliates. Of course, the nomination of Khairy surprised many; it is learnt he’s serious and rumoured to have obtained cabinet approval. 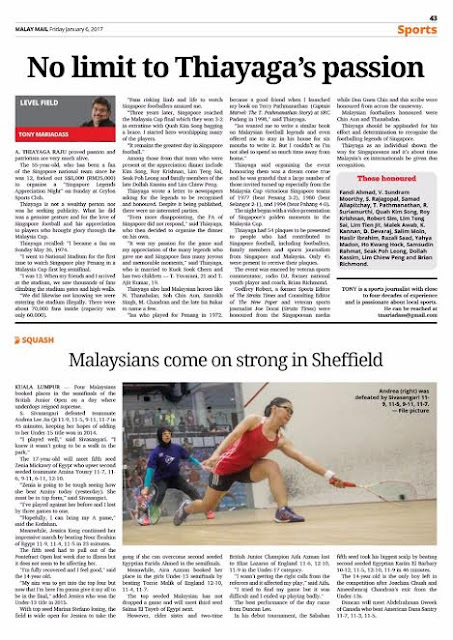 There has been a tacit understanding cabinet ministers should not hold posts in sports associations. The only minister who is still holding a post in a national sports association is Datuk Shahidan Kassim, the president of Amateur Swimming Union of Malaysia (Asum) since 1996. He was last re-elected in 2015. He is said to have gained permission from the cabinet for his foray into a national sports leadership role. Khairy is, without doubt, passionate about football and has been steering the National Football Development Programme (NFDP). 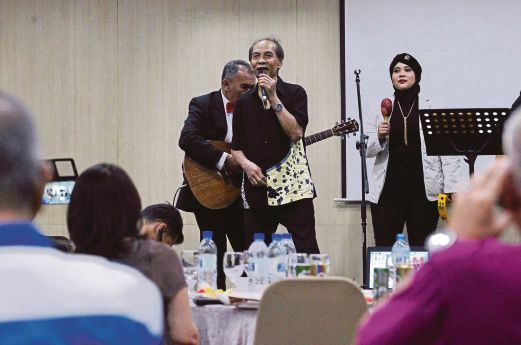 There have been indications Khairy could move up to the education ministry. He has already said the sports and education ministries should be twinned. But the question is, should he run for the president’s post, will it not be a conflict of interest between specifically tending to FAM and minding the general store of all sports associations in the country? How will the national sports associations (NSAs) react if he decides to run? 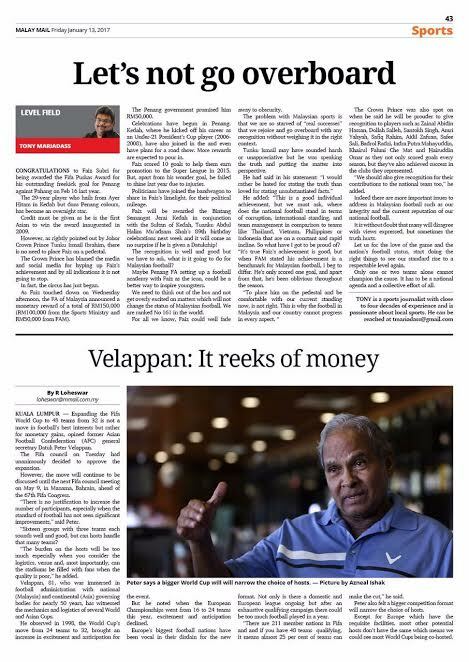 On the grapevine, the indications are it will be a two-cornered fight between Khairy and Aseh. Tunku Ismail and Annuar are expected to make way. Annuar is also going for deputy president. Interesting days ahead indeed, but whether at the elective congress on March 2, the better candidates win is left to be seen. FAM are infamous for internal politics wherein affiliates vote candidates who will look after their interests. 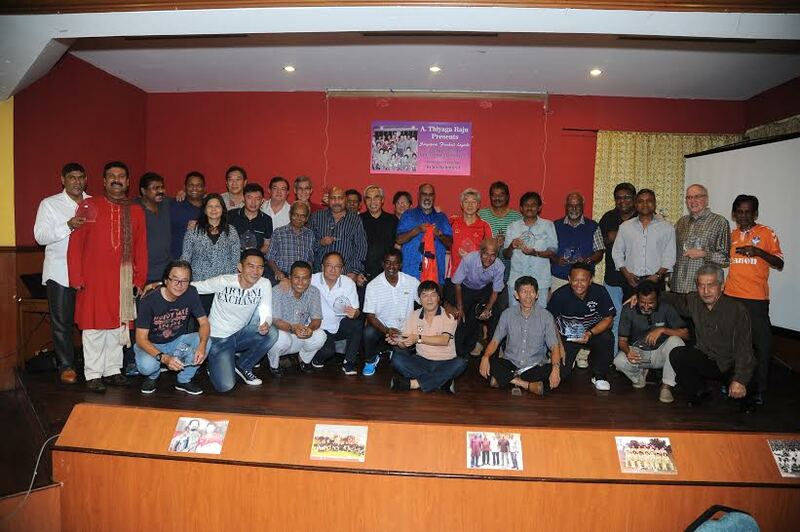 Keen campaigning is going on and indications are that votes will be cast for subservient candidates instead of independently critical ones who are prepared to work and possess ideas to turn Malaysian football around. There is speculation all the early excitement could just fizzle out. Let us not be fooled anyone who helms FAM will be able to turn around Malaysia’s fortunes on short order. A turnaround is going to be a long term process; whether the fans will be patient and support the plans is another question altogether. Besides, the affiliates could well be a difficult bunch to deal with for the new president. It’s no surprise in FAM, the real power brokers are the ones who hold sway in the pre-council meetings, held before the actual council meetings take place. The actual council meetings are a breeze, merely endorsing pre-arranged decisions. 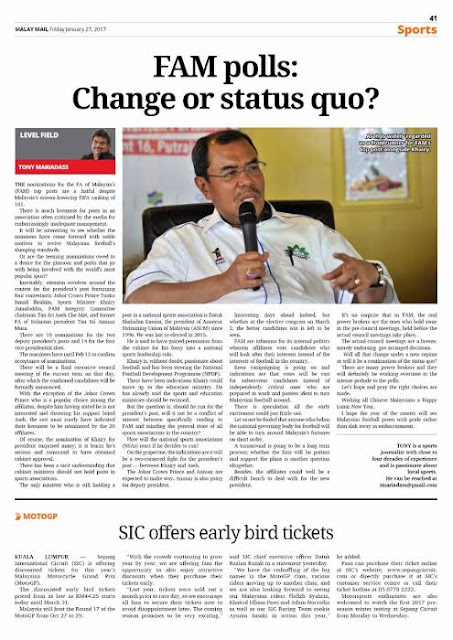 Will all that change under a new regime or will it be a continuation of the status quo? There are many power brokers and they will definitely be working overtime in the intense prelude to the polls. Let’s hope and pray the right choices are made. Wishing all Chinese Malaysians a Happy Lunar New Year. I hope the year of the rooster will see Malaysian football preen with pride rather than sink in embarrassment. CONGRATULATIONS to Faiz Subri for being awarded the Fifa Puskas Award for his outstanding freekick goal for Penang against Pahang on Feb 16 last year. The 29-year player who hails from Ayer Hitam in Kedah but dons Penang colours, has become an overnight star. Credit must be given as he is the first Asian to win the award inaugurated in 2009. However, as rightly pointed out by Johor Crown Prince Tunku Ismail Ibrahim, there is no need to place Faiz on a pedestal. The Crown Prince has blamed the media and social media for hyping up Faiz’s achievement and by all indications it is not going to stop. In fact, the circus has just began. As Faiz touched down on Wednesday afternoon, the FA of Malaysia announced a monetary reward of a total of RM150,000 (RM100,000 from the Sports Ministry and RM50,000 from FAM). The Penang government promised him RM50,000. Celebrations have begun in Penang. Kedah, where he kicked off his career as an Under-21 President’s Cup player (2006-2008), have also joined in the and even have plans for a road show. More rewards are expected to pour in. Faiz scored 10 goals to help them earn promotion to the Super League in 2015. But, apart from his wonder goal, he failed to shine last year due to injuries. Politicians have joined the bandwagon to share in Faiz’s limelight, for their political mileage. Faiz will be awarded the Bintang Semangat Jerai Kedah in conjunction with the Sultan of Kedah, Tuanku Abdul Halim Mu’adzam Shah’s 89th birthday celebrations next week and it will come as no surprise if he is given a Datukship! 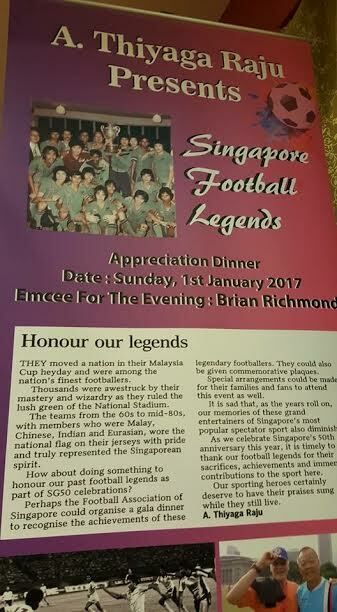 The recognition is well and good but we have to ask, what is it going to do for Malaysian football? 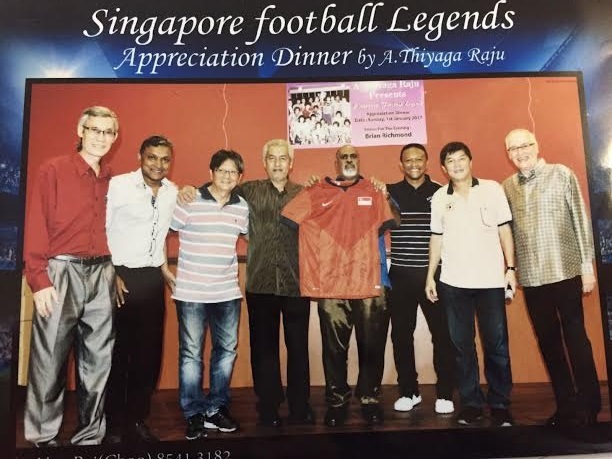 Maybe Penang FA setting up a football academy with Faiz as the icon, could be a better way to inspire youngsters. We need to think out of the box and not get overly excited on matters which will not change the status of Malaysian football. We are ranked No 161 in the world. For all we know, Faiz could well fade away to obscurity. The problem with Malaysian sports is that we are so starved of “real successes” that we rejoice and go overboard with any recognition without weighing it in the right context. Tunku Ismail may have sounded harsh or unappreciative but he was speaking the truth and putting the matter into perspective. He added: “This is a good individual achievement, but we must ask, where does the national football stand in terms of corruption, international standing, and team management in comparison to teams like Thailand, Vietnam, Philippines or Indonesia that are on a constant and rapid incline. So what have I got to be proud of? “It’s true Faiz’s achievement is good, but when FAM stated his achievement is a benchmark for Malaysian football, I beg to differ. He’s only scored one goal, and apart from that, he’s been oblivious throughout the season. The Crown Prince was also spot on when he said he will be prouder to give recognition to players such as Zainal Abidin Hassan, Dollah Salleh, Santokh Singh, Amri Yahyah, Safiq Rahim, Aidil Zafuan, Safee Sali, Badrol Radzi, Indra Putra Mahayuddin, Khairul Fahmi Che Mat and Hairuddin Omar as they not only scored goals every season, but they’ve also achieved success in the clubs they represented. “We should also give recognition for their contributions to the national team too,” he added. 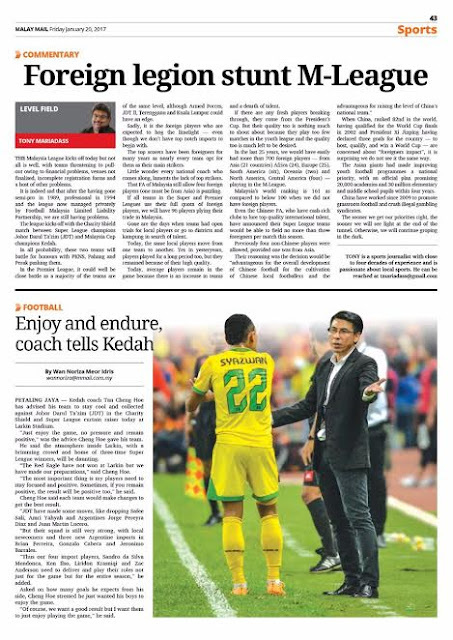 Indeed there are more important issues to address in Malaysian football such as our integrity and the current reputation of our national football. It is without doubt that many will disagree with views expressed, but sometimes the truth hurts. Let us for the love of the game and the nation’s football status, start doing the right things to see our standard rise to a respectable level again. Only one or two teams alone cannot champion the cause. It has to be a national agenda and a collective effort of all.